Perfectly Cooked Brown Rice | Time to Cook! I don’t know about you, but I always seem to mess up rice! I know it’s a simple thing to cook, but if you are off on something (size of the pot, amount of the water, level of heat, cooking time, etc.) you can be left with a sticky mess or burnt rice. I’m so bad at cooking rice, that lot of times I resort to (don’t tell!) Boil-in-a-bag Success Rice, but that’s not as good for you. We are supposed to be eating slow-cooked foods — and choosing whole grains over white. 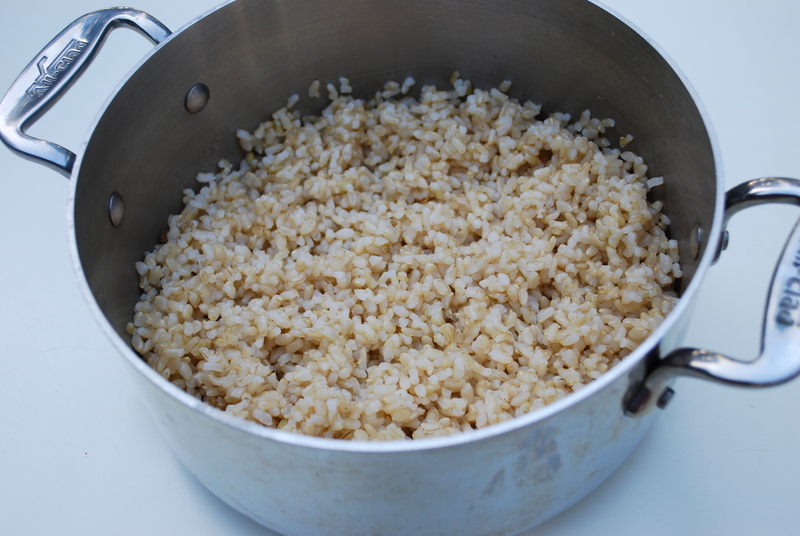 So, I was over-the-moon when I tried Gwyneth’s recipe for Perfectly Cooked Brown Rice. Just like it promises, your rice will turn out beautifully and it does keep well in the fridge for a few days. Rinse the rice thoroughly in a fine-mesh strainer until the water runs clear. Place it in a pot set over high heat with the water and a big pinch of salt. Bring the mixture to a boil, lower the heat, cover the pot, and cook until all the liquid is absorbed and the rice is cooked through, exactly 45 minutes. Turn the heat off, place a dry paper towel between the pot and the lid, and let the rice sit for at least 5 minutes before giving it a fluff with a fork.